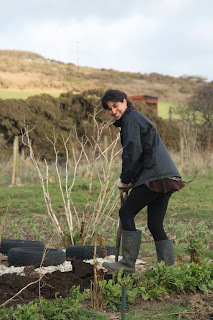 Ann-Katrin, a wwoofer from Germany, left the farm recently after six weeks volunteering with us. Many thanks Ann for your hard work and parsnip chutney! 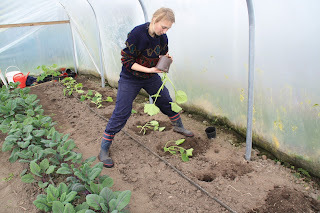 Ann-Katrin planting courgettes in the polytunnel at the beginning of March. On the fourth and fifth of April we planted salad seedlings into one third of our outdoor salad protected bed, and covered them with insect-netting. The bed had been covered with black plastic all winter, then uncoverd, dug-over, and compost added before planting. The seedlings are predominantly lettuce-family and other non-brassica salads, because these cope with increasing day-length better than brassica salads, and were sown and raised in the propagation polytunnel six weeks prior to planting out, then hardened off. The outdoor protected salad bed covered for winter. Betty digging out the surviving dock roots from the first third of the bed. 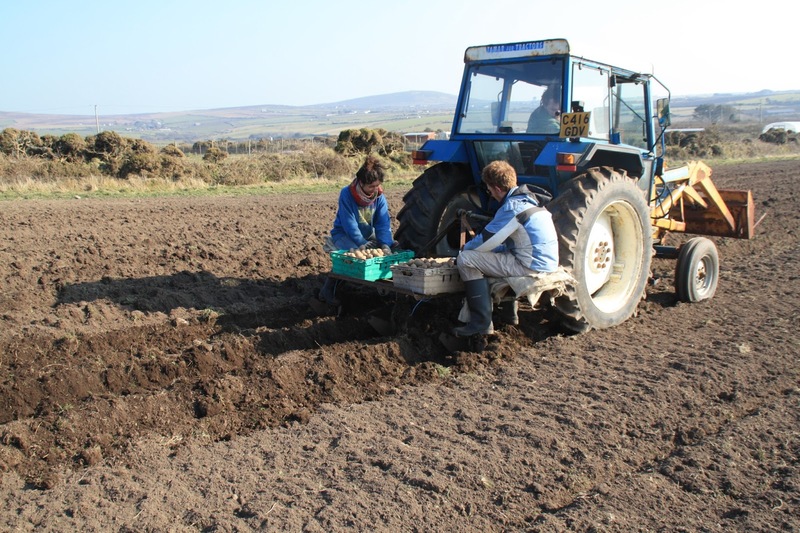 Ben and Ian planting salad seedlings in the prepared bed. We hope to start harvesting salad from this outdoor bed at the beginning of May, to compensate for pulling all the bolting salad plants out of the Sausage polytunnel in order to fully plant it with this year's tomato crop. Small £6 veg box - Valor potatoes, purple kohl rabi, mixed salad leaves, French breakfast radishes, cauliflower, purple sprouting broccoli. Small £6 box - Sarpo Mira potatoes, French breakfast radishes, parsnips, mixed salad leaves, purple sprouting broccoli, and a savoy cabbage. 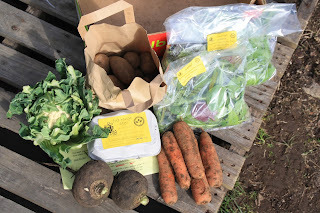 Standard £10 box - Sarpo Mira potatoes, French breakfast radishes, parsnips, mixed salad leaves, purple sprouting broccoli, a savoy cabbage, watercress, and Oriental stir-fry greens. Elliot (from Stratford-Upon-Avon) and Marie (from France) left the farm at the beginning of April, having spent one month wwoofing with us. We'd like to thank them for their invaluable contribution to work on the farm, and wish them well in the new farm in Wales. Marie and Elliot planting potatoes on the back of the tractor in March. We had three flocks of laying hens on the farm, the oldest of them having arrived on the farm in September 2013 (the other flocks arrived in October 2014 and April 2015 - we have kept these two younger flocks). There were about 80 surviving members of the oldest flock, being two and a half years old, most of whom were still laying the occasional egg. At the end of March we began to re-home these so-called "spent hens" to local families and smallholders, and after a full-page article in The Cornishman for Easter we managed to re-home all of them in the space of three days. We'd like to thank all the local people who gave homes to our hens, and for the generous donations made to the farm for them - we hope they have settled in well and are still laying. Since the oldest hens left we have replaced the dilapidated floor in one of our three sheds, and brought in a new flock of 120 point-of-lay (22 week-old) hens, who have settled in well and are already laying about 100 pullet (small) eggs per day - these are now available in the farm shop and at farmers markets for only £1 per half dozen - I'm told they are the best eggs for poaching! 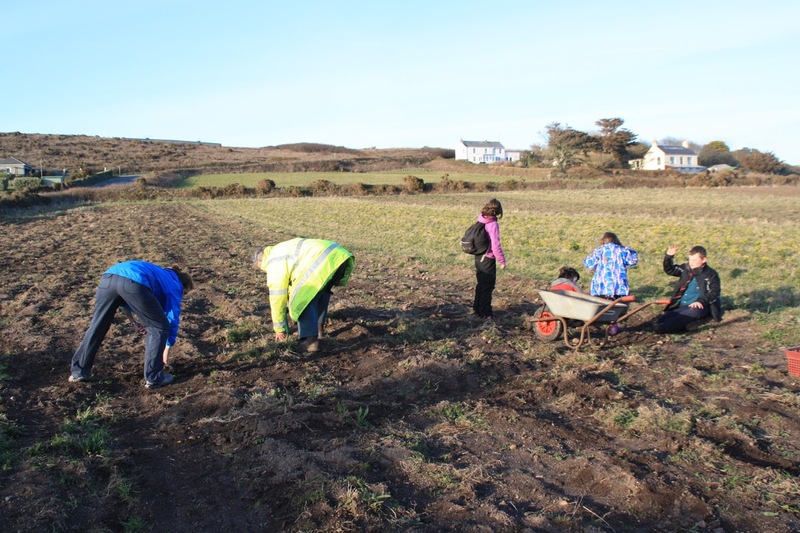 After the success of our globe artichoke patch over the past two years, this year we have decided to expand it so as to produce more, and also to mulch it with a layer of cardboard followed by a covering of municipal compost, to keep the weeds down and help the plants along. Laying out cardboard, then covering with compost. 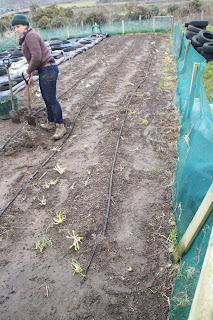 Marie and Elliot working on the globe artichoke patch. We have used old car tyres as mini-windbreaks around the plants, and also around the rhubarb plants next to them. 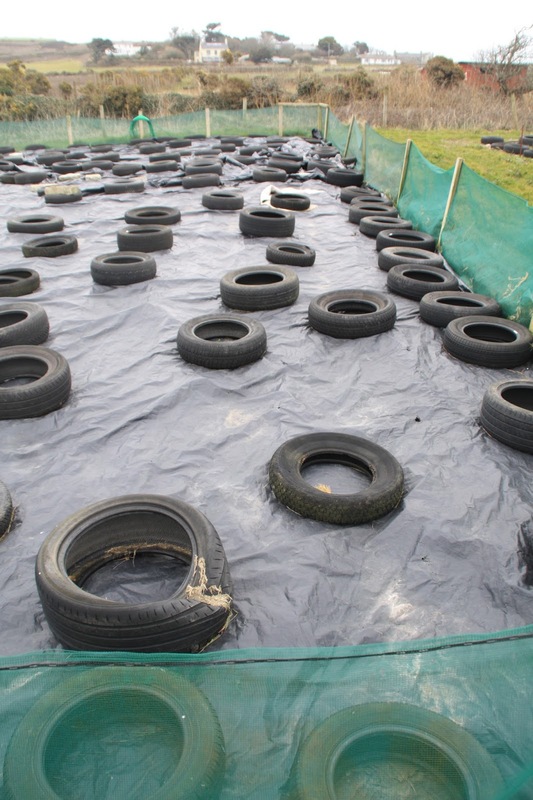 We'll remove these tyres in late spring once the weather has improved and the plants are strong enough to fend for themselves. 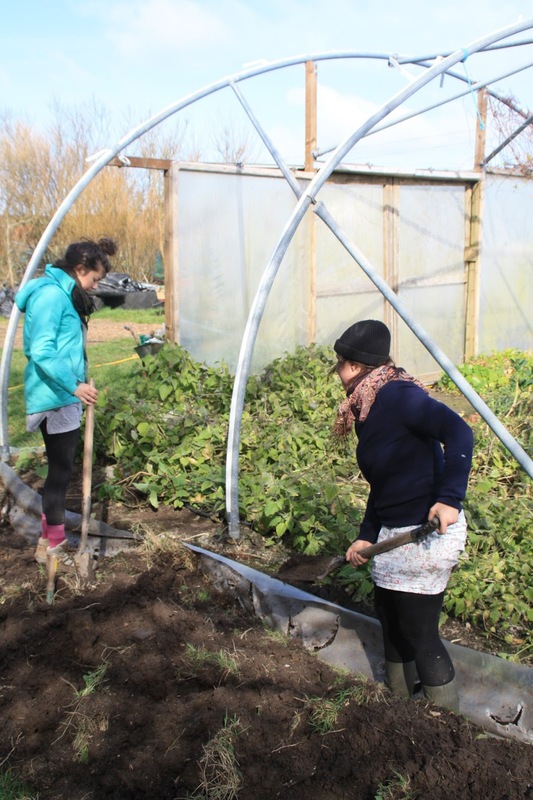 Betty from Germany, and Francesca from London, both left the farm at the end of March, having spent a week volunteering as WWOOFers - thanks for your help! 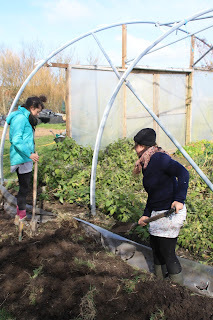 Here they are digging out the old plastic from our cover-less Mothership polytunnel, in preparation for re-skinning it later this spring. 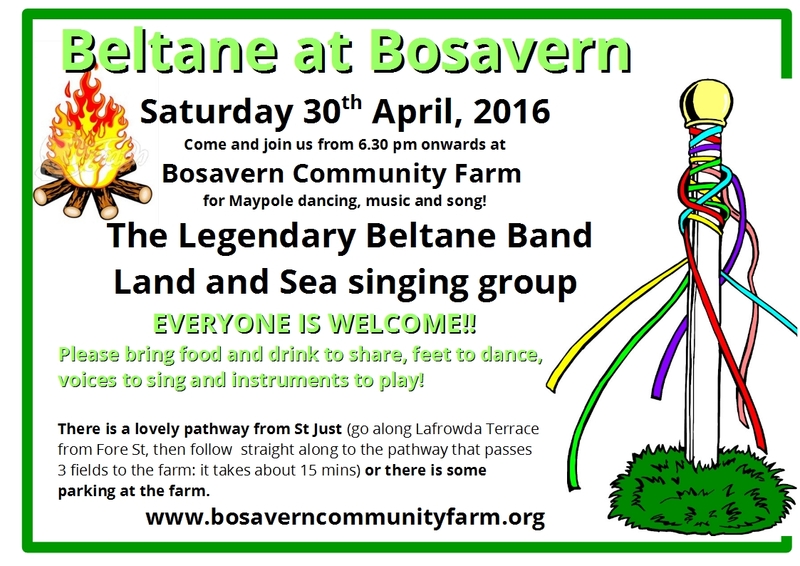 We were glad to receive a small working party from Cape Cornwall Scouts on the evening of March 25th. We rolled our sleeves up, donned work gloves, and picked up a van-full of reject potatoes that had been left lying around the Four Acre field. We want to sow this area with a grass and wildflower mix to help it revert to traditional hay meadow, and don't want thousands of "volunteer" potatoes sprouting amongst the wildflowers. Many thanks to the scouts and their leaders - we now have a lovely clean area ready for sowing. 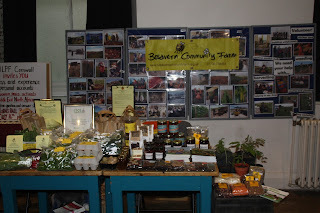 The annual Green Fair was held in the Acorn Theatre in Penzance on Saturday 26th March, and Bosavern Community Farm had a stall there for the day, selling a range of our fresh produce, plus some tomato plants, oak trees, and a range of local goods from our farm shop. We have had a stall at the Green Fair for the past five years; it's a great way to catch up with likeminded projects and people, and to get out there into the community. This year's fair was one of the best yet, we were busy all day and had almost sold out of stock by mid-afternoon. 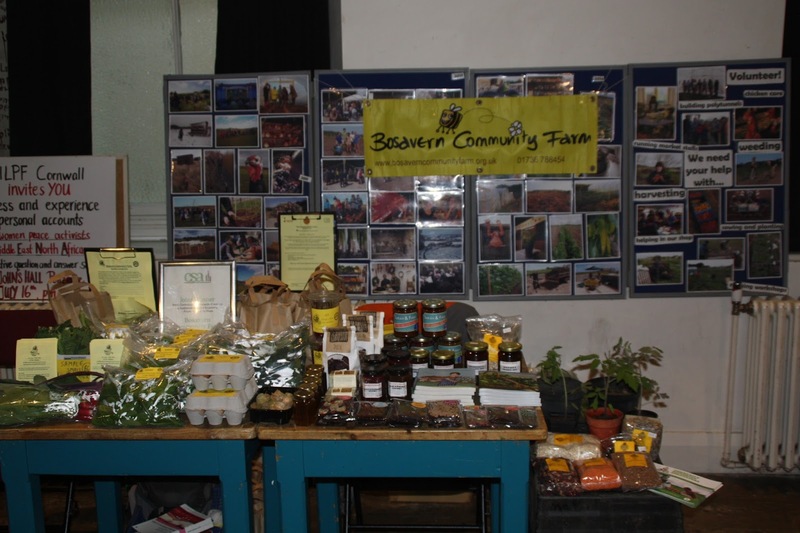 Other projects with a presence at the fair included Transition Penwith, The Green Party, Penzance Country Market, Women's Peace Network, Amnesty International, Penwith Organic Growers and Gardeners (POGG), and many others. The food was great too!! 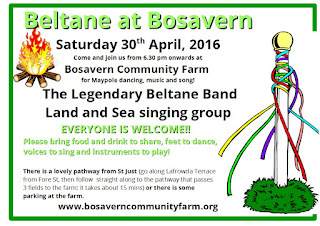 And the music! Our small £6 veg box with an optional extra of half a dozen of our free-range eggs for £1.50 - this week's box contained black Spanish radishes, potatoes, mixed salad leaves, Oriental stir-fry greens, plus a cauliflower and some carrots from a local organic farm. On Saturday March 19th we ran a workshop on the farm, showing how to establish an area of willow coppice specifically for harvesting for basketry and other rural crafts. Despite the weather being rather iffy, the workshop was well attended and all the necessary work was done in the day. 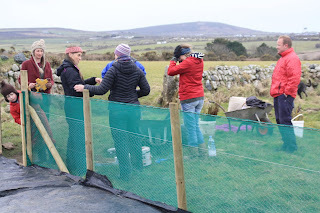 We had previously constructed the rabbit-proof fencing with wind-mesh, to enclose 100 square metres in the corner of our wettest field. The first task of the day was to cover the area with weed-suppressing black plastic, and secure this against the strong Penwith winds with ground-pegs. 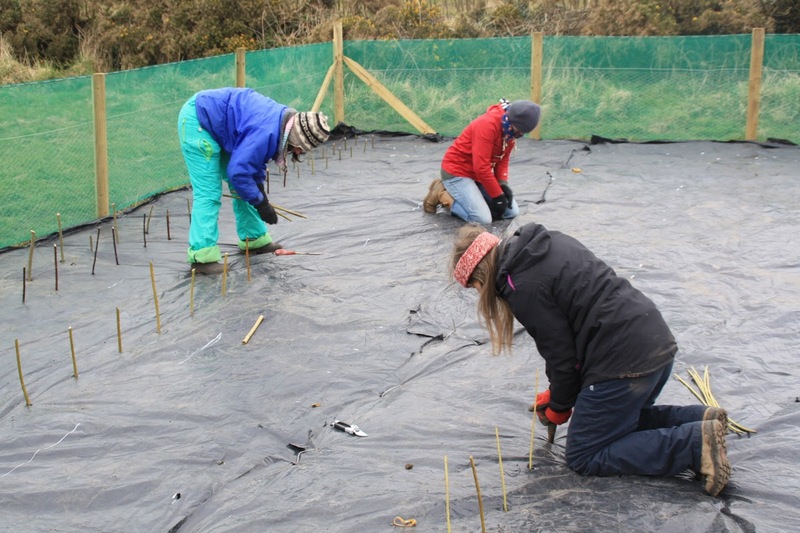 Then we prepared the willow for planting (willow whips of several different kinds were kindly donated by local eco-projects), measured the lines within the area, and planted the whips through holes in the plastic. Many thanks to Nikki for running the workshop, and to all the attendees for their donations for the day - we hope you learned a little and enjoyed it a lot! 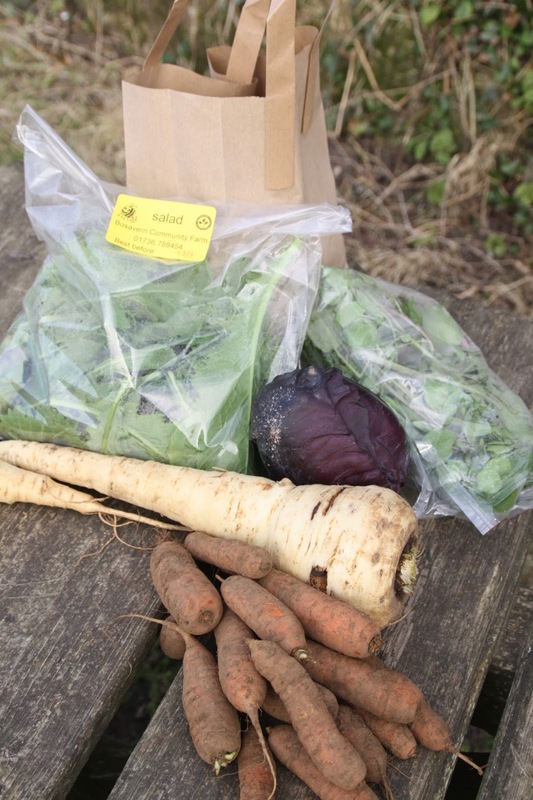 Our small £6 veg box from March 18th - half a kilo of local organic carrots, half a kilo of our own parsnips, a local organic red cabbage, a bag of our mixed salad leaves, some of our watercress, and a kilo of our potatoes. 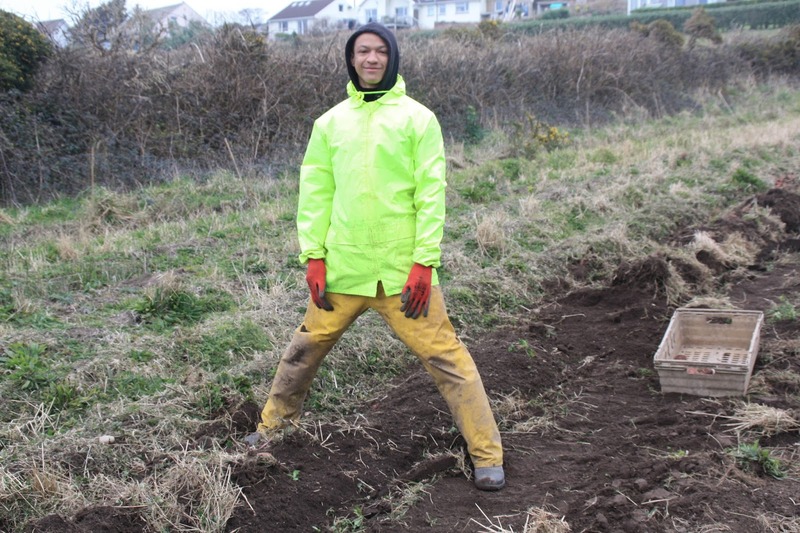 Cameron, from Paris, also left the farm last month, after volunteering with us for six weeks. 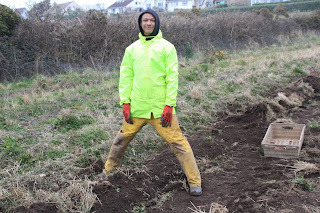 In this photo he's helping to lift the last of our potatoes (see previous entry). Many thanks to Cameron for his hard work, and good luck back in France. 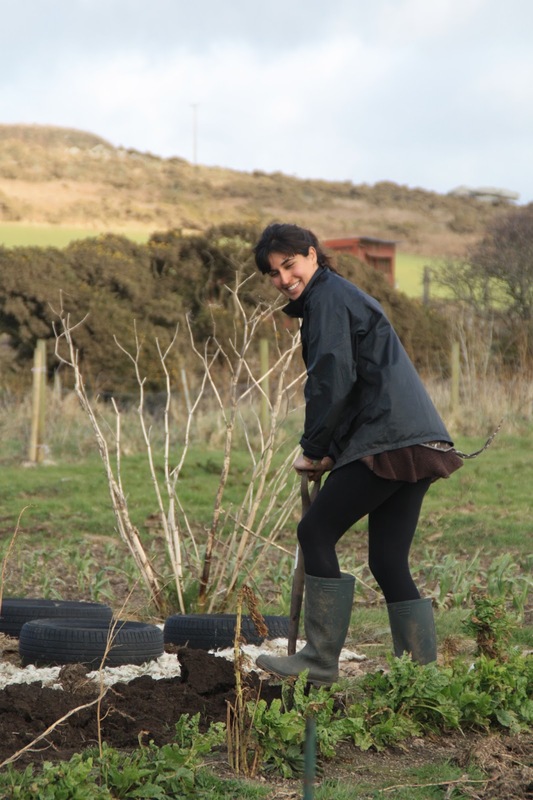 Rita, from Lisbon, pictured above digging a bed for rosemary bushes in the perrenial section of the market garden, left the farm last month, and we'd like to thank her for her time volunteering with us, and wish her well in her onward travels.